At age fifteen, Ned Halloran lost both of his parents--and almost his own life--when the Titanic sank. Determined to keep what little he has, he returns to his homeland of Ireland and enrolls at Saint Edna's school in Dublin. Saint Edna's headmaster is the renowned scholar and poet, Patrick Pearse--who is soon to gain greater fame as a rebel and patriot. Ned becomes deeply involved with the growing revolution . . . and the sacrifices it will demand. 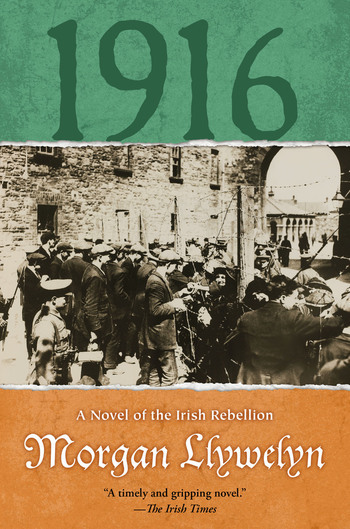 Through Ned's eyes, Morgan Llywelyn's 1916 examines the Irish fight for freedom--inspired by poets and schoolteachers, fueled by a desperate desire for independence, and played out in the historic streets of Dublin against the background of World War I. It is a story of the brave men and heroic women who, for a few unforgettable days, managed to hold out against the might of the British Empire. Since 1980, award-winning author Morgan Llywelyn has created an entire body of work chronicling the Celts and Ireland, from the earliest times to the present day. Her critically acclaimed novels, both of history and of mythology, have been translated into many languages. Her books include historical fiction such as The Irish Century series and Grania (basis for the Broadway musical The Pirate Queen); award-winning historical fantasies like The Horse Goddess, Bard: The Odyssey Of The Irish, and the New York Times-bestselling Lion of Ireland; and science fiction thrillers such as Drop by Drop. She is an Irish citizen and lives in Dublin.